The seventh-annual Big Backyard 5K is happening on Sunday, June 5 at Marymoor Park in Redmond. This run/walk is an event for the whole family as it’s dog and stroller friendly. All participants will receive awesome t-shirts, refreshments, snacks, prizes and the satisfaction of supporting King County Parks! The chip-timed course winds around the magnificent (but flat) Marymoor Park, so it’s perfect for a PR. Register by April 13th, to receive the early bird price AND a BBY5K hoodie for 5$ thanks to our friends at Harborstone Credit Union. There’s also a free kids dash for those 10 and under! So register now to run and support your regional parks. See you all there! If we’re lucky Bert the Salmon might be making a special appearance :). 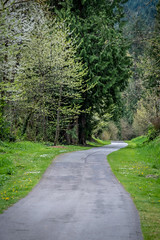 Previous Post Trail Alert: Section of Snoqualmie Valley Trail now open!